The Kolona beach has crystal clear blue waters and coarse golden sand. It is ideal to enjoy the sea and swimming in its cool and clear waters, surrounded by this beautiful landscape. Also because of its location, it is protected on both sides from the wind thus attracting yacht owners, sometimes to the point where bathers resent their presence. At Kolona beach you will not find the “Armiriki” trees that characterize most beaches nor will you find sunbeds, since it is not an organized beach. So it is advisable to arrive with the necessary equipment. At the eastern section, connected with the island of Kythnos, there are a number of lodgings. There is also a tavern operating where you can taste local and other delicacies or enjoy a coffee and refreshing beverages. On the western edge of the “sand column” at the islet, is the chapel of St. Luke. Going up the trail you can enjoy the panoramic views and capture images of the spectacular beach and bay. It is a fact that anywhere you stand, natural beauty is such as to allow the collection of unique images both for the mind and your mobile or camera. It is a great opportunity for excellent selfies as well. 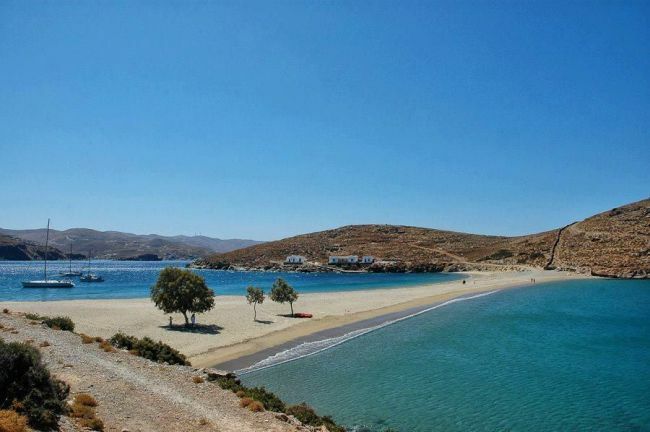 Many people choose to reach the famous beach of Kolona, Kythnos, by water taxi from Merichas, because of the difficult road access. Kolona beach is a haven for recreational vessels since it provides a twin natural harbor protected from the “Meltemia” (Greek Aegean summer winds) and southerly winds. It is often chosen by boats, inflatables and sailboats that moor in sheltered bays. Kolona beach is located north of the port of Merichas. It is 9 km or 20 minutes from Merichas, you reach it by passing by the beach of Apokrousis and continue to the left on a dirt road. The last three kilometers of the route present a difficulty as the road at several points are inclined and quite narrow. From Hora it can be reached by covering a distance of seven kilometers lasting about 17 minutes, with a southwest direction and at the crossing to Merichas you stay on the right, you reach the beach Apokrousi after which you follow the road to Kolona. Hikers who follow the path to the archaeological site of Vryokastro, often continue on the descent to the beach of Apokrousi and from there continue on to Kolona beach. There is also a path that starts from Chora all the way to Apokrousi with a length of about 4.2 km and from there you can continue on to Kolona. In any event, it would be good to consult the municipality information office.